In an intriguing rumble, tough 140-pounder Junar Adante, 27, of Surigao del Sur clashes with experienced southpaw Ryan "The Crusher" Sermona, 31, in the main event of "Night of Champions XV, the exciting fighting show organized by Award Winning promoter Gabriel "Bebot" Elorde set for December 9 at his famed Elorde's Sports Complex in Parañaque, Metro Manila. Junar Adante (7-10-1, 4 KO's) takes on come-back-kid Ryan Sermona (20-9-1, 13 KO's) of Negros Occidental, a former regional titlist who has been away from fighting action for about a year. Some fans thought that Sermona was not interested in boxing anymore. Far from the truth. Because "The Crusher" is back with mean intentions, and Adante is the target. Will the more active Junar Adante capitalize on Sermona's ring rust? Or will the more crafty Ryan Sermona make good use of his southpaw stance, speed and ring-smarts to confuse and overload the warrior from Surigao with better boxing skills, making him miss and pay? 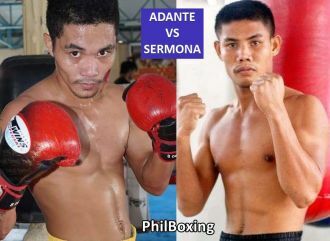 According to promoter Bebot Elorde, the Adante vs Sermona duel is meant to be a thrilling match-up with non-stop action and fireworks. In addition, the war is valid as final eliminator for the Filipino Super Lightweight Title. MEDURA VS CABINTOY: 10 ROUNDS @ 118 LBS. In the co-main feature, "Little Navarrete" Glenn Medura, 23, climbs the squared ring to battle tough 28 year-old Aurora fighter Diosdado "Dado" Cabintoy. 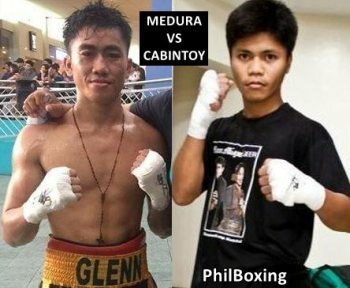 Coming back to the Motherland after a rough campaign in Japan, Glenn Medura (9-4-1, 5 KO's) badly needs for a clear and decisive victory over Dado Cabintoy (15-8-2, 8 KO's) that will carry him back to the winning column. Will Medura be able to emerge victorious? Or will Cabintoy make good use of his experience and good focus to achieve a win over Medura, scoring the most important victory in his boxing career? The Medura vs Cabintoy 10-rounder rumble is the Final Eliminator for the Philippine's 118 Lbs. Championship. 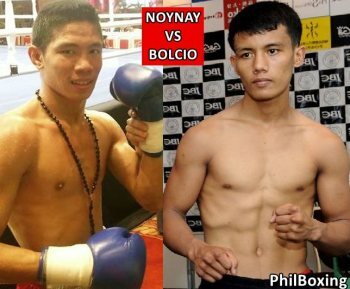 NOYNAY VS BOLCIO: 8 ROUNDS @ 132 LBS. Plus, as special attraction, world-ranked WBO Asia-Pacific Youth Super Featherweight Champion Joe Noynay (15-2-1, 5 KO's) of Bogo, Cebu, rumbles in a non-title stay-busy fight against 32-fight veteran Nathan Bolcio, a tested ring warrior who hails from the rugged mountains of Kapangan in the beautiful highlands of Benguet Province. An unexpected defeat to the experienced Benguet boxer would be disastrous for Joe Noynay, 23, a world-rated young boxer with potential and undeniable skills, although with a fighting style that needs to be improved so that less of his fights get affected by non-intentional headbutts. Four (4) more professional fights complete the 7-bout "Night of Champions XV", another exciting event organized by Gabriel and Arlene Elorde, in cooperation with matchmaker Patrick Pepito Pante and Hon Pon Casale; and the support of Chicken Champ, Mist PH, Elorde Fit Alabang at Filinvest Mall, and Hyper HD on Cignal TV. The author Carlos Costa is a Panama-born veteran man of boxing. Carlos can be reached by email: Carlos512@hotmail.com and by Whatsapp: +639184538152.